Dealing with domain name transfers and account changes can be very difficult with some of the Domain Name Registrars. To transfer your domain name from one registrar to another sometimes requires jumping through a number of network hoops. Recently I received a request for help on getting their domain name renewed and updated with the correct account information and administrator on record at the place where it was registered. This particular place wanted to charge an arm and a leg to have the registration renewed. I suggested a Domain Name Transfer to a New Registrar. Once this process is initiated, an email is sent to the current administrative contact with a security code (Auth-Info Code is a unique code generated on a per-domain basis) that must be entered into the process at the new location. It is imperative to have access to the old registrar in order to perform certain items to allow the transfer to go through. One: must unlock the domain name. When the domain name is in a locked mode the name is protected from any types of transfers. Two: must be able to receive the transfer request as the administrative contact. If you are not the Administrative Contact then you will have to either, contact the person who is, or change the administrative contact person in the control panel. If you do not have access to either of these then see: The importance of keeping your administrative contact information close to you. Three: make sure the whois is updated. Note: updating the administrator does not necessarily change the whois data base. Network Solutions for example, makes it so that changing or adding a new administrator does not change the whois area. It takes a lot of looking around and scanning to the bottom of one of the pages to find the whois update link. Once these criteria are meet then initiate the transfer request. Transfer requests must be allowed unless certain other items are present. Refer to the FAQ for Domain-Name Holders. Completing the transfer can take up to five days under the ICANN rules. If difficulties arise contact your new registrar. If your company has many domain names locked away for potential future use and your current registrar is charging thirty dollars or more per name, that can add up to large dollars annually. Most domains can be registered for less than eight dollars a year or additional savings if done for extended years. My recommendation is Godaddy.com for all your domain name registration needs. If you need assistance services in this area contact Professional Web Services for help. We offer full Internet marketing, Online advertising, and SEO services and Online solutions for the B2B and B2C industries. Interesting story last month about Wal-Mart having a domain name URL stripped away from an individual. In this story Wal-Mart went to the WIPO Arbitration Center. There were four points that the arbitration panel had found that were in violation by the individual. In essence what this individual was doing was in direct conflict with ICANN policies. Is this a watershed case? What about all the cloned url websites? How will this affect free speech? Where does free speech stop and protecting legitimate trade marks begin? Will we see more cases brought to arbitration? As a business continues to expand sometimes it makes more sense to register another relevant domain name instead of placing everything under one URL. Some of the larger companies may actually have dozens of names for intellectual property, special applications and features. From a practical standpoint it is much easier to compartmentalize operations as well as custom designing layouts and applications specifically tailored to each area of operation. Additionally, as businesses grow there are probably many people with-in the organization that need to have access to various parts of websites. By providing different websites this prevents things from getting crossed up between personnel. Even for small business, using other domain names can be beneficial for handling items such as Email marketing, online lead capture, or newsletter mailings where there are a number of hosting services that provide templates and other programs for Email marketing purposes. Other areas for consideration are blogging, Wikis, or content management for the company or customers. Instead of re-inventing the wheel it is much easier to take the software that is already available online and provided by numerous hosting companies, to establish another account with a domain name related to what you wish to do. Sure, a business could do it with a subdomain (subdomains are in front of the domain) but having a registered domain can make it easier for a client or customers to remember. Additional insight from a marketing, advertising, and branding perspective. It is much easier to establish a product brand by using the name in the domain. Many times a product will have great brand recognition in the media and by taking advantage of this brand recognition online can really help promote the product or service even more. For help with Internet marketing, online advertising, and branding strategies for your business contact Professional Web Services. What to build a family website? Need a DBA with your sir name? Domain names are not just for businesses. It is amazing how easy it is to establish a website for personal use today. Millions of people are signing up for their very own domain name. The cost can be under ten dollars per year along with some providers even offering free hosting services. If you do not want to pay for a registered domain name you can still establish a personal site using a free blogging service incorporating the sir name into the blog. Personal domains are not just for personal use. Other applications for this are if you have a service related job or a salesman, and are marketing and advertising yourself, or have a DBA by your name consider having people finding you on the Internet by simply typing in your last name. This has been an excellent way for Realtors® to be found online in their local market place from clients that know them. If you are new at this start with a blog. Sign up for a free blog and try a test site. If it does not turn out the way you like simply delete the blog and start again. When I first started, I blogged about something that was being talked about online at the time. I even did it anonymously to begin with because of concerns of online privacy issues. I kept it private up until recently. Since that first blog my concerns have somewhat subsided because in today's world simply being alive will get you in the record book somewhere. If you don't believe me, check out the birth certificates. This was my first blog. Another example of technical experimenting for layout, design, sales, marketing, and technology concepts can be viewed at our test blog. If all of this sounds like it is way over your head, our team can help you with your Internet marketing and online advertising needs. Contact us today for a free Internet marketing evaluation. Above all, we will tell it like it is, and do it with style! I am still pulling out my hair on trying to get my SMTP Server and IMAP/POP3 mail server functioning properly. It seems as though it functions intermittently. I have gone through tier one level support and now am on to tier two support. Here is the scoop so far. Two days ago, I could not turn on the function on the OSDL Linux remote server. Trouble ticket was sent. Next day it was turned on. Can now toggle. Started adding Email boxes and verifying operation of Emails one at a time. Verified using various mail clients. Everything looked OK.
Today, mail intermittently will receive but most of the time can not send. Verified system POP3 and SMTP mail server settings. Toggled with authorization then without. No change. Spoke with several people at the service center. All were helpful but still no solid answers. Sent off an email to the next level and referenced the original trouble ticket which I believe still may be a factor on the problem. Tried rebooting the server. No change. Tried long and short e mail login names i.e. help@domain-registration.xyz or just help. No change. Verified DNS values. Everything looked OK there. After spending eight hours on this I am ready for a Java break. Man, what a time killer this IT stuff! IMAP/POP3 Server is now working! Appears as though there was an internal issue with IMAP/POP3 Server. Could not turn on the mail services applications server. Not sure why this was occurring. Service is now running and all is green to go. Hopefully all will be stable. Time to configure mail boxes. What do you do when a catastrophic failure occurs? That was the starting point. Six days latter, two dozen phone calls, dozens of emails, dealing with three different web hosting service providers, my wife asking me what the heck is going on countless times, frustration upon frustration, and finally a website back online. Not completely. Apparently, most hosting companies do not own their own data centers. When a data center is sold with out any notice, the hosting providers that are paying rent space are then at the mercy of the new owner. If a new owner decides to move an entire data center, by truck and does not take the leased equipment with them then you are SOL. Compounding the problem was the RAID drives were not compatible at the new location servers and a large number of websites were completely down and still are. So, I had to go back to my selection process for a new hosting company. Well, after striking out with my first selection, I went another route. Virtual dedicated. Not everything I wanted but it has huge bandwidth and lots of storage capacity. Most everything is up, except my POP3 Email server. Problem on the server end. Check back at this blog for an update. 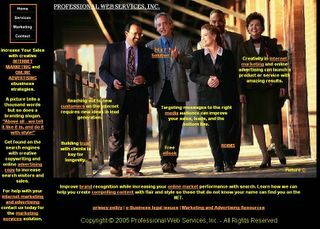 Professional Web Services, Inc. net marketing, Internet advertising, and advertising copywriting. How Do You Choose a Host Service Provider? Once you have gone through the domain name registration process the next stage is choosing a host company. With hundreds if not thousands of hosting service providers online, it can be a frustrating task of selecting a service provider to host your domain name. I am always the cynic when it comes to referrals online. It is so easy to make a company look great with good recommendations for different hosting providers that it is hard to filter out the good with the bad at times. Even after careful analysis and checking out forums I have come to the realization that things are not always perfect unless you are willing to pay for high redundancy. What is their customer service response time? Can you talk to a live person? Do they provide a contact phone number? Can you get a hold of them? Pick a provider that does not allow obscene material. How easy is it to navigate the control panel? If more than one website is going to be run then consider having a reseller type account. Check out the forums online for recommendations. Do searches for the providers name to see what types of comments are mentioned from other websites. Keep options open for streaming video and audio. Not all companies have this option. Provide enough hard drive storage and bandwidth to cover your needs. Consider the type of operating systems. Linux or Windows based. Linux based systems are generally less expensive. Email considerations. How many email boxes will you be having? IMOP that unlimited boxes are the way to go. Are there SPAM filters and spyware blocking built in? Online access to email or Web eMail. Consider shopping cart software for selling items from your website. Provide for Databases such as MYSQL Database. Provide SSL (secure socket layer) for secure transmission of data. Web apps for more advanced site development such as PHP and MOD_PERL. Expansion into other forms of content delivery such as Podcasting. Does it have the capablities for setting up blogs? Option for dedicated IP address. Access to log files and web site statistics. I place the cost aspect last. Costs range all the way from less than five dollars a month all the way to fifty dollars or more for shared hosting. Shared hosting means more than one website is place on a server. If a dedicated server is required then the starting costs are somewhere around sixty to several hundred dollars per month. A dedicated server is only used for your account. Bandwidth requirements and storage capacity is what determines the price points. If a service provider loads their computers up with hundreds of clients then this will ultimately slow down the down load speed at which someone could get access to your B2B or B2C website. New domain hosting service providers are showing up continually. Do not get locked into a long term contract with any one Domain host. If a problem occurs it is much easier to switch to another service. If you are having problems right now you can always switch to the new Host before you cancel with the old. This provides for a seamless integration with no down-time for the website. For help with your website, Internet Marketing, Advertising Online, multimedia streaming videos, and technology and professional branding services contact us: Professional Web Services.